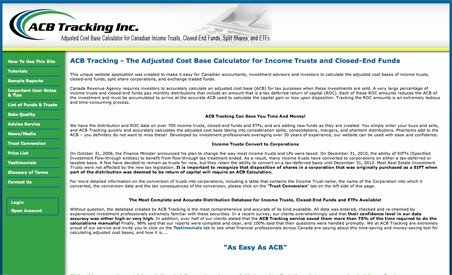 ACB Tracking is the Adjusted Cost Calculator for income trusts and closed-end funds. Industry professionals with over 30 years of experience developed a database of distribution and ROC data for over 700 income trusts and closed-end funds, making it the most accurate and detailed database of its kind. Created for Canadian accountants, investment advisors and investors, ACB’s calculator allows them to save money and time on what would otherwise be a tedious task. Because ACB Tracking requires no training, industry professionals can immediately begin producing accurate, reliable calculations.